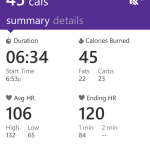 Well it was time for me to purchase a new tech toy and the Microsoft Band ended up being the toy of choice. I am a Microsoft nerd and a technology geek and yes there is a difference. Anyway, whenever I want to purchase a new toy, I have to do enough research to make sure that it is going to do what I want and work/play well with my other toys; that would be my Surface Pro 3 and a Nokia Lumia 928 with Windows 8.1. Well, I have a Polar F11 watch with a Polar H7 heart rate monitor that I have used exclusively over the past 5 years. I like the zone training it provides and that it syncs online so that I can track my exercise history. Now I really do like this device but it is old and doesn’t sync with my phone, nor does it track my steps. So a few years ago the company I work for got us great deals on the first version of the Fitbit. 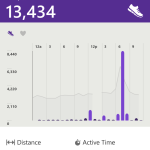 This is what really got me tracking my daily steps and getting more into fitness. I really liked that it could track my steps, record exercise activity, record how well I sleep and sync wirelessly. The only problem with this version was that it was made of plastic and would break at the bend because of poor quality. Once I broke 2 of them I wasn’t buying a third. I also tried the first version of the Nike Fuelband but it lasted less than a year and wasn’t nearly as good as the Fitbit. Well I really liked my Polar F11 watch, so they were automatically in the running. After reviewing the ones currently, available I selected the Polar M400 as my first candidate. I already have an account on Polar’s training website: it is a free account, I have historical data there and I already have the heart rate monitor. Also the heart zone training is excellent. Next I had to take a look at what Fitbit had to offer. I was torn between the Fitbit Surge and the Fitbit Charge HR because they really offered a lot of what I wanted and I liked the accuracy of the original Fitbit that I had. I also had an account with them so I can see my historical data. I decided against the Fitbit Surge because I wouldn’t be able to use it’s full phone capabilities with my Windows phone. So the choice was the Fitbit Charge HR. 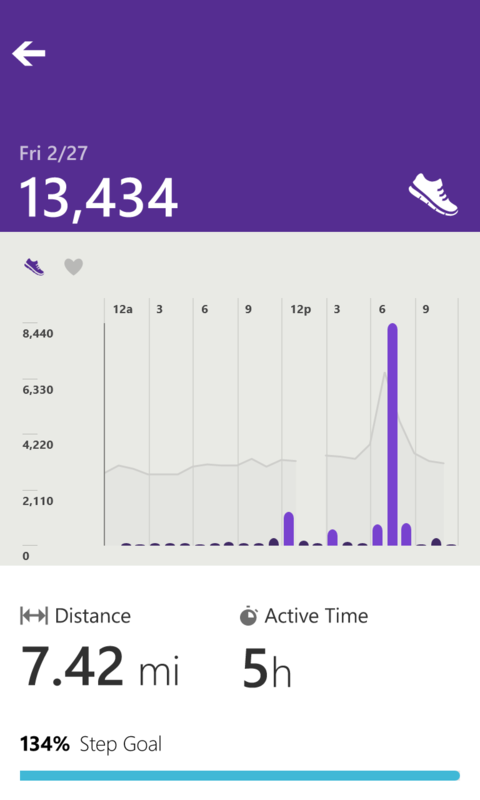 Then came the Microsoft Band. Of course this is going to work with my Windows phone and Surface, they are all Microsoft products. It can track my heart rate, work with my Windows phone completely and the exercise capabilities really grabbed my attention. How well does this fit? With the face of the band being flat and long, it started to feel quite awkward wearing it on the top of my wrist. So I flipped it over and found it a lot more comfortable. This now answers why most of the Microsoft Band videos the people where wearing it this way. Setup was really easy. I plug in the charger and it turned on automatically. I already had the Windows app downloaded on my phone so I started the initial configuration, entering in my personal data, in the app and then connected to the band via Bluetooth. It had an update to do and then the fun began. I left this at default since I really didn’t know which ones I wanted but I did add Twitter and Facebook just to see what they would do. You can add up to 13 tiles and with the recent update, a biking feature was just added. I downloaded 3 additional apps, as a recommendation from a friend that has the band also: Pimp my Band, Band Sensor Monitor and Clear my Band. Pimp my band allowed me to add a photo of my wife and me to the screen, Clear my Band allows you to clear all notifications on the band and Band Sensor Monitor isn’t free but it allows you to see all the current sensors readings in real time. If you get the monitor app, make sure you close it properly or you will leave the sensors on the band transmitting and therefore run down the battery quickly. Steps obviously start immediately. I haven’t been able to test the accuracy yet but I will be soon. Plain and simple it just happens. I set my goal for 10000 steps per day but living in Michigan during the winter makes this a little difficult since I can’t walk outside at lunch. The one thing that I don’t like about this is the fact that you can’t adjust the steps manually in the app. I will explain why this is a much needed feature later. Calorie burn is good information also but I let the band set a calorie goal for me. You should set it to a goal that meets your fitness goals but I just hadn’t gotten that far yet. I do like the fact that I do hit my goal when I go to the gym. I get close as long as I try to move more often throughout the day. I will have to do a little more work here. Now this is the feature I couldn’t wait to use. I really like working out on an elliptical and I wanted to see how well the band would work. I wore the band on my left wrist with the face on the underside of my wrist and my Polar watch on my right wrist. Starting the exercise session is easy. Select the workout tile then press the action button and the timer begins. 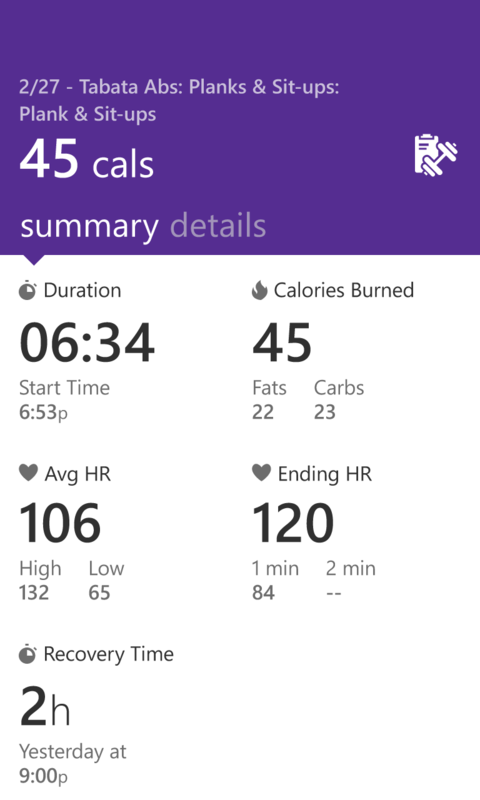 This is where I started to compare the heart rate reading on Microsoft Band to the Polar heart rate monitor. Since my Polar heart rate monitor is also compatible with the elliptical, I can see my heart rate on the elliptical display which is great to see at a quick glance. Once I began my workout all of the readings where really close, so of course I was happy with that. 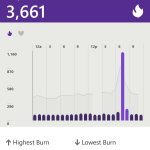 Once my heart rate got around 135 bpm the Microsoft Band started to get way off. It was about 20 bpm above what my Polar read. I then grabbed the handles on the elliptical so that it would read my heart rate from my hands and found that the Polar reading was similar to the elliptical reading. Now I am a little disappointed. The next day I decided to switch wrists and wore it on the underside of my left wrist. This was just to see if there was a difference. The end results was the same. 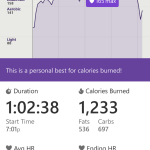 The heart rate readings were still consistently 20 over after I reached 135 bpm. Now 2 days in a row and no luck with an accurate heart rate reading during a high intensity workout. Day 3 and I decided to switch the watch to have the face of the band on the top of my left wrist. Now this test had a lot better results. For at least a 30 minute period the band was within 2 bpm of my Polar heart rate monitor. Besides placing the band face on the top of my wrist, I made sure that it wasn’t too tight. The other noticeable difference was the heart icon in the upper left corner remain filled during this time. This symbol seems to indicate that the band has acquired and locked onto my heart rate. When the band was rotated with the face down, this symbol didn’t always have a lock on my heart rate. I assume that this is what didn’t help with the accuracy of the band. Now with the band being worn on my wrist I didn’t expect the steps to be accurate. However knowing the steps are recorded on the elliptical, you would think you could adjust what the band has recorded right? No, it isn’t possible. This is going to be one of my requests for an enhancement with the app. This is a feature I really like. There is a good variety of workouts available from beginner to advanced levels and different target areas. I downloaded a few I was interested in and was ready to test. I switched the band back to the underside of my left wrist and started the workout. The band vibrated quickly and the timer started. It displays what exercise you should be doing and started to count down. It then vibrated again for a rest period and for the next set of repetitions. Wearing the band on the underside of my wrist this made it easy to see what was next and I liked that a lot. If you can’t complete the set, you can just press the action button to bypass it. Once you are done and the band synchronizes, you are able to see how well you did and it even counts the repetitions you completed for each set. Now that is awesome. Measuring how well I sleep at night is a very interesting option. Some days I know I am really tired and didn’t sleep well but I just don’t know why. This feature indicates the amount of restful sleep, light sleep, the amount of times you woke up, the amount of time it took you to sleep, efficiency and duration of your sleep. It also indicates your resting heart rate which I never had a good method of measuring before. Lastly it indicates the calories you burned while sleeping. This is really good information but if you are looking for a trend, there isn’t a way to add more information to that record. 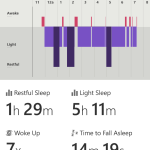 If I am trying to find out what caused me to sleep poorly consistently, I will have to track this a different way. This will be my next request for an enhancement. 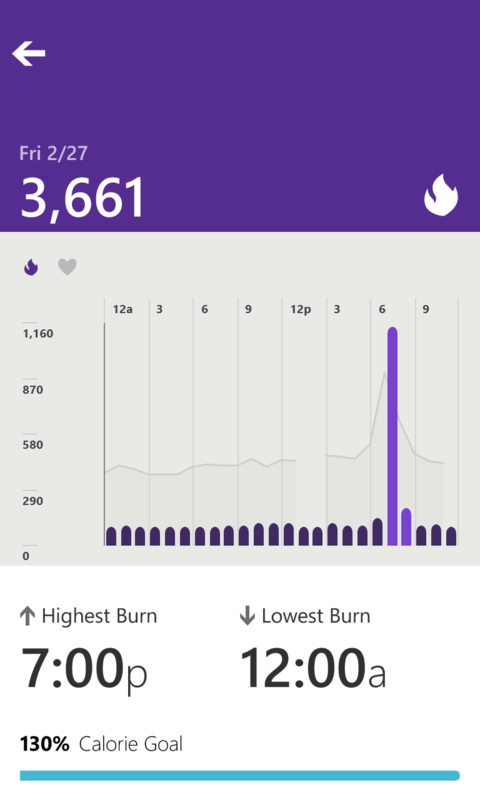 I would give the Microsoft Band 3½ stars out of 5. To get an additional star from me, they have to get the heart rate accuracy fixed. I hope they can resolve this with a software fix because if this is a hardware defect, then it misses a major benefit of using it. The band mobile app needs some enhancement but I would expect that Microsoft can and will enhance it over time. I didn’t try the running or biking features as I live in Michigan and it is too cold to exercise outside so that will have to wait until the summer. This review was only on the fitness features of the band so look for another review on the other features the Microsoft Band has to offer.